Here is a nice men’s Columbia deal to check out. 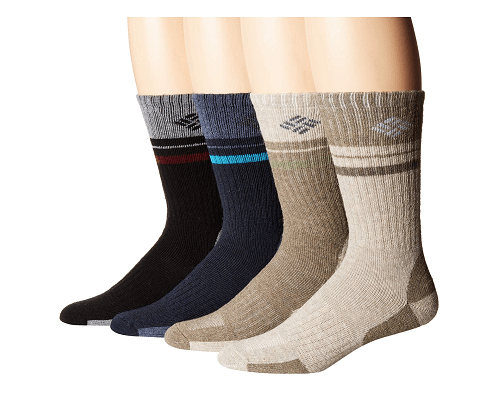 6pm is offering this Columbia Pop Stripe Wool Crew Socks 4-Pack for $12.99! That is down from the normal price of $26, for a 50% savings. Plus, through tomorrow the 17th, they are offering free shipping on all orders. Stay comfy on the trail this season with these Columbia® Pop Stripe Wool Crew Extended Sizes 4-Pack of socks! Athletic ribbed cuffs help keep your socks in place when you’re on the go. Y-stitch heel forms a cup around the heel for added comfort and helps reduce pull down and bunching inside your shoe. Breathable performance mesh panels allow greater air flow to keep your foot cool. Low profile toe closure lies flat to reduce chafing and has minimal bulk. 55% polyester, 35% acrylic, 8% wool, 2% spandex.